At a previous non-profit I worked in a case management program that focused on youth ages 18-19. All of the options we had to offer were post-care and intervention focused, meaning it was all after they faced abuse or violence in their relationships. I will always remember them saying that prevention was what they wish they had. They wanted to have conversations before the violence occurred, to be saved from the pain they experienced, to learn how to carry themselves and enter into certain situations and relationships with more understanding. 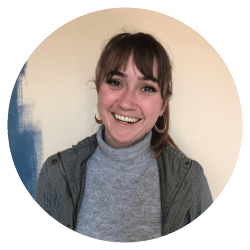 At that point, the preventative aspect of my work became really important to me, and I wanted to move in a direction where I could do more outreach. A youth I worked with was in an abusive relationship, so he broke up with his girlfriend and became homeless as a result. Unfortunately this was a prevalent issue for many of the youth I worked with. In this case he didn’t know how to separate himself from the relationship without becoming homeless. It was really difficult to find him the help he needed, because the options available didn’t fit the situation he was in. He was either unqualified or had to lose something—like becoming homeless first in order to meet the requisites for housing assistance. I’ve realized how important it is that we have more resources for prevention, to reach out to people, including youth, before they face sexual or domestic violence. On top of that, resources that connect programs with other issues areas, like housing and unemployment, are important if we plan to end sexual violence. My role of coaching and mentoring was often frustrating because youth didn’t have access to resources in the community, nothing was preventative, and the aspects of care always centered post-care services. 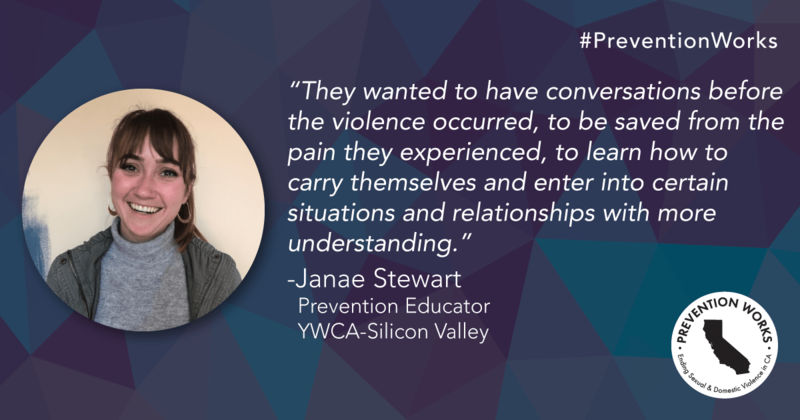 At YWCA-Silicon Valley, I’ve been able step into an outreach role as a Prevention Educator in school based programs, where I can make a strong impact. Our prevention program is more than just handing out flyers and doing presentations. We really get involved in the work we do and make change one classroom at a time. I’ve realized any number of classrooms we step into can make a huge difference, but the more we do, the more resources we need. This allows us to grow from one classroom at a time to a whole school district.